However much of this is, frankly, junk. "Donating" broken, shabby or useless items only shifts the cost of sorting and sending it to landfill onto charities, which the National Association of Charitable Recyclers has reported collectively costs A$13 million a year. So here's how to make sure your tidying spree doesn't create a bigger mess for someone else to sort out. It can be tempting to think struggling people should be grateful for any sort of serviceable items, even if they're old-fashioned, shabby or a bit grubby. But these people have self-respect, and deserve it from us. Further, most donated items are not actually distributed directly to people in need. Unpublished research by the Institute for Sustainable Futures found major Australian charities often only give 5-10% of donated items directly to clients. Instead, most items are sold through op-shops to raise money to fund their social services. This means donated items need to be attractive enough for people to willingly buy them. Another way to dodge dealing with our rubbish is "wish-cycling". Have you ever wondered if something is recyclable, only to decide that if it's not, then it should be, and proceed to tossing it in the recycling bin? This is wish-cycling: hoping/wishing a tricky item is recyclable, and assuming someone at the other end will either remove it, or devise a way to recycle it. Unfortunately, this generally isn't what happens. It can be expensive or impossible for a recycling plant to sort waste streams with that level of detail. Unrecyclable material can contaminate entire batches, meaning whole loads are sent to landfill, not just your unrecylable item. In other words, pretending our rubbish isn't rubbish might ease our conscience but ultimately creates more waste. Professional waste managers will tell you the first step in cutting down on landfill is reduction – not buying so much stuff in the first place. Obviously that ship has sailed if you're reading this article, but do keep it in mind. But if you're getting rid of clutter, which presumably includes items in reasonable condition as well as broken or useless things, you do have a few options. Before donating anything, ask yourself: what condition is it in? Would you pay money for it? Or give it to a friend? 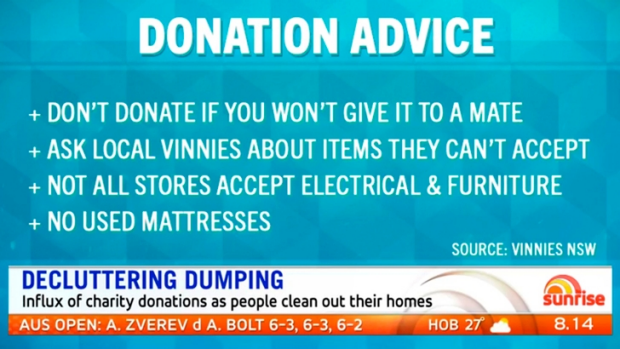 Vinnies has a slogan: If it's not fit for a mate, don't donate! If it's in good shape, by all means donate it to a charity. If you're not sure, you can call and ask your local charity shop. What if you have something your local charity won't take, but you think someone might want it? Try listing it for free on a classified site like Gumtree, a Facebook freecycling group, or look for local tipshops and upcycling enterprises that could turn your unwanted trash into someone else's treasure. If an item is not quite worth reusing, see if you can turn it into something else. Battered shelves can be plant stands; old clothes can become cleaning rags. Almost anything can be a plant pot if you shovel in enough dirt. Pinterest can be a great source of DIY inspiration and there are a raft of books and websites filled with inspiration on repurposing and "upcycling". So, you've carefully separated out your quality items to donate, given your excess coathangers to a drycleaner, and turned an old t-shirt into a cushion cover. But what do you do with everything left over? One option for bulky items such as broken furniture, old appliances and electronics is to use council services such as scheduled or bookable collections and waste dropoff days. Your council website or sites such as Planet Ark's Recycling Near You can tell you what can be taken where and when. It's important to note that aside from certain electrical and metal goods, most items collected from kerbside by your council are sent to landfill. This is something many people don't understand: nearly 50% of us incorrectly think the majority of collected items are reused, recycled or otherwise salvaged. Few councils have the resources to sift through thousands of tonnes of collected rubbish to salvage reusable items. So if you're putting it out for collection, you're mostly still throwing it out – though some items may be grabbed by salvagers before being collected, the proportion is still low. However putting things out on your kerb simply in the hope someone will see and take them (when you haven't booked a council cleanup) is also considered dumping, and is illegal. It's good to think about what we need and don't need, and reducing clutter has clear benefits. But if you're really trying to create peace and joy, then think carefully about what to do with your once-but-no-longer wanted items, and don't dump them on charities or the kerbside. Jenni Downes is a Senior Research Consultant, Institute for Sustainable Futures at the University of Technology Sydney.